Wildly successful VR campaigns from industry giants like Lexus, Marriott Hotels, McDonald's, Carnival Cruises, Best Western, UNICEF, and Red Bull have shown that VR has become a powerful marketing tool. It’s taking advantage of innovative product placement, create interactive trailers, engage with branded mini-games, create intense emotional experiences, and more. Mobile VR from the likes of Sony, Facebook, and HTC already has an audience in the millions — 67% of smartphone users have tried, or want to try, VR experiences. And as hardware prices come down and haptic feedback devices become common, that number will continue to blow up. VR isn't just a disrupter—it's an earthquake reshaping the marketing landscape. 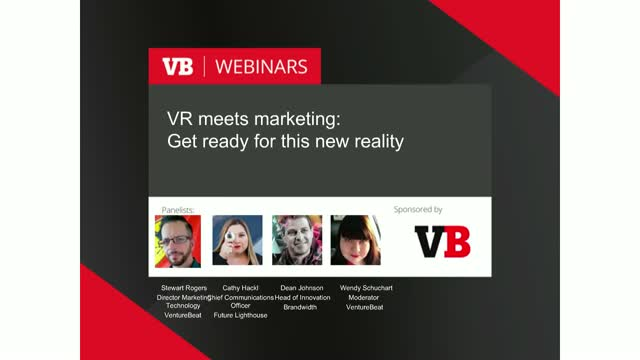 Join today's VR innovators in this VB Live event and learn how to take emotion-driven marketing to the next level.